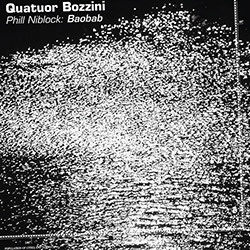 Montreal's Bozzini Quartet of Clemens Merkel (violin), Alissa Cheung (violin), Stephanie Bozzini (viola), and Isabelle Bozzini (cello) perform two Phil Niblock orchestral works exploring overtone patterns in acoustic instruments: "Disseminate" (1998) and "Baobab" (2011), which Niblock adapted for the quartet by arranging multiple tracks that are mixed into the final work. The Montreal string quartet Quatuor Bozzini of Alissa Cheung on violin, Clemens Merkel on violin, Stephanie Bozzini on viola, and Isabelle Bozzini on cello is extended with double bassist Pierre-Alexandre Maranda as they perform composer Simon Martin's work of long tones and timbres, exploring the nature and philosophy of sound, and our relationship to it. 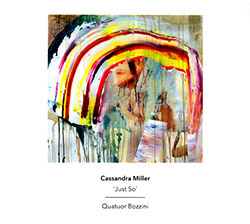 A disc of extraordinary string works by Canadian composer Cassandra Miller, presenting four string quartets superbly played by the Quatuor Bozzini quartet of Clemens Merkel on violin, Alissa Cheung on violin, Stephanie Bozzini on viola, and Isabelle Bozzini on cello, including the large work "About Bach", awarded the Jules Leger Prize for New Chamber Music. 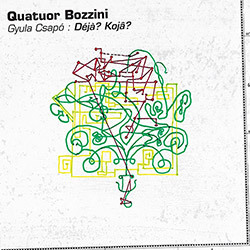 Quator Bozzini / Gyula Csapo: Deja? Koja? 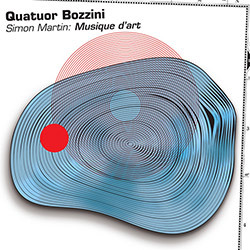 The Canadian Council for the Arts commissioned this work by Hungarian composer Gyula Csapo, a student of Morton Feldman amd John Cage, realized by Montreal's Quatuor Bozzini quartet, "Deja? Koja?" meaning "Already? Where to?" is a three-part work with two intermissions, an epic work that references the same basic materials in a variety of perspectives. 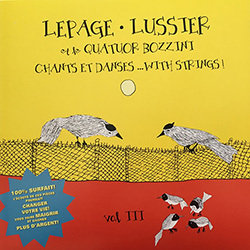 Taking two of Montreal's most vital musicians, guitarist Rene Lussier and clarinetist Robert Lepage, and joining them with the far-ranging string quartet Le Quatuor Bozzini for a stunning album that merges chamber music, noise music, and improvisation without leaving behind melody, intention and direction; magnificent! 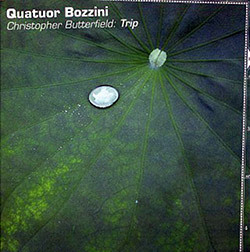 Montreal's Quatuor Bozzini string quartet worked with composer Christopher Butterfield, who wrote two of these pieces ("Trip" and "Fall") specifically for QB, alongside three other works from 20 years of composing that use unusual instructions and scores for the performers. 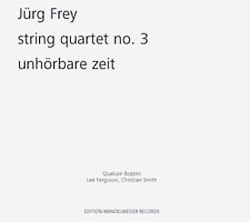 Two works from composer Frey performed by Montreal's string ensemble Quatuor Bozzini: "String Quartet No. 3", a minimal work of colors, sensations, shadows, durations; and "Unhorbare Zeit" exploring durations without sound, or empty volumes, to achieve lucidity and transparency. 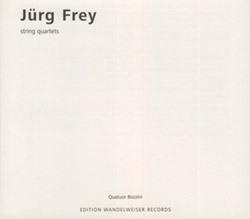 Composer Jurg Frey's 1988 work "String Quartet" realized by Nadia Francavilla, Clemens Merkel, Stephanie Bozzini and Isabelle Bozzini, exploring ideas of audibility: the moment when sound waves move in space and the air touches the body. 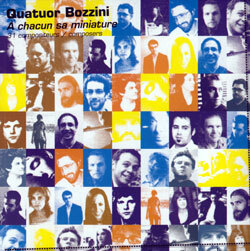 The Quatuor Bozzini string quartet dedicate this double CD to emerging artists in a collection of miniatures written in 2011 by emerging composers for the QB's annual Composer's Kitchen event. 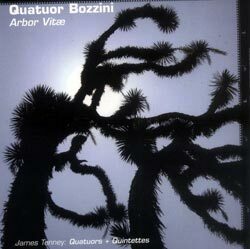 Michel Gonneville's dreamlike, shamanistic journey, "Hozhro", in a brilliantly executed reading by Montreal's Quatuori Bozzini with vocalist Marianne Lamber & saxophonist Mathieu Gualin.